After GEZI PARK and GULSUYU the struggle continues at METU: Let’s protect our urban habitat against violation and abuse! This entry was posted in Statements and tagged Gezi Park, METU, Ottowa Gezi Platform on 25 October 2013 . This entry was posted in News and tagged METU, Police brutality, tear gas on 21 October 2013 . Protest Action commemorating Ahmet Atakan killed in Armutlu, Hatay while protesting in support of METU resistance. This entry was posted in Protests in Turkey, Visual Memory and tagged Ankara, Hatay, İstanbul, Kadikoy, METU, Police brutality on 10 September 2013 . This entry was posted in News, Protests in Turkey and tagged Hatay, METU, Police brutality, Taksim Solidarity Platform on 10 September 2013 . 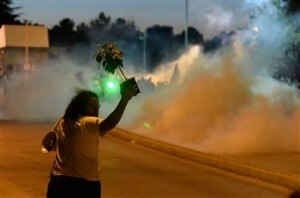 This entry was posted in News and tagged Ankara, METU, Saving Campus Trees, Student protests on 6 September 2013 . This entry was posted in News, Protests in Turkey and tagged Ankara, Gezi Forums, METU, Protecting trees, Student activism, Subway access on 26 August 2013 .